The Nicholas E. Wagman Observatory is located in Deer Lakes Regional Park, Frazer Township, PA, near the village of Russellton in northeastern Allegheny County and some 18 miles from Pittsburgh. 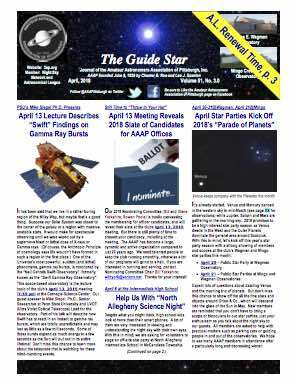 The members of the Amateur Astronomers Association of Pittsburgh invite the public to Nicholas E. Wagman Observatory. Nearly 67,000 people have visited the observatory since its opening in 1987. Come and see what they’ve discovered and you’ve been missing. Admission is free, though we gladly accept donations to cover the cost of operation. To reach Wagman Observatory, follow the Orange Belt (accessible from Routes 8 and 28) to Deer Lakes Park, near Russellton. Follow the road through the Park for 1.2 miles and turn left on to the Observatory grounds. Please use parking lights only when you drive through the gate. For additional directions or to check on the weather conditions, please call the observatory at 724-224-2510. If you get our voice mail or a busy signal, keep trying. We receive many calls for information just before and during the star parties.